Richard Gwynn was the son of Thomas Gwynn and his wife, Martha. He was baptised at Berkeley on 31st January 1755. Thomas Gwynn was an alderman of Berkeley and his trade was described as a soap boiler. Richard became a soap boiler like his father and he had a business in Thornbury South Gloucestershire. We know that in 1794 Richard took on an apprentice soap boiler John Carwardine. Richard Gwynn married Ann Tombes on 8th May 1788 in Thornbury. Ann and Richard had three children; Thomas born 18th March 1790, Nathaniel born 11th September 1791 and Elizabeth born 17th July 1793. Elizabeth Gwynn died as a baby. In the land tax records of 1798 Richard Gwynn was the tenant of Mrs Watts as well as of John Crowther. We are not sure where the property owned by Mrs Watts was. The land tax records of 1800 and 1809 show that John Crowther owned the property that was occupied by Richard Gwynn. We believe that this included Porch House in Castle Street in Thornbury. In 1808 John Crowther, the brother of Ann Tombes senior left a considerable estate, part of which went to his niece Ann Gwynn (the daughter of Ann Tombes and the wife of Richard Gwynn) in trust for her son Thomas Gwynn. Another part of his estate was left to Ann’s sister Betty Smith. We believe that this property included Porch House. Even though John Crowther died in 1809, the land tax records of 1809 and 1810 continued to show that he was the owner of a property which we believe included Porch House and that it was occupied by Richard Gwynn. This is not unusual as it seemed to take a year or two for the records to be brought up to date or possibly the trust that was set up for Thomas in this will had not yet been settled. The electoral records for 1811 showed that Richard Gwynn was now the owner of the property that he occupied, although it seems he was holding the property in trust for his son Thomas. The land tax of 1814 shows that Richard Gwynn owned three properties. He occupied one of the smaller ones valued at 1s. This smaller one may have been the property in the High Street where Richard had his soap making business. He had a tenant called Mrs Coombs in the other small property which was valued at 1s. A gentleman referred to as Mr Hunt occupied the larger one which was valued at 8s 6d. A document of 1815 lists the properties from which a charge was payable to the Corporation of Thornbury for a charitable trust in respect of the bequest of John Hilpe. The list does not mention the Porch House property as there was no such charge on that property but it does refer to a property for which Richard Gwynn was then paying a rent of 4/4. We now know that this property was what later became 45 High Street. It seems that Richard Gwynn moved into Castle Street by 1819, presumably into Clematis Cottage. The Land Tax Records show that Richard Gwynn rented the property at 45 High Street to John Carwardine by 1819. This is probably an indication that Richard had given up soap making by this time and that his former apprentice had taken over the business. Ann Gwynn had died on November 5th 1816 aged 62, leaving Richard Gwynn a widower. 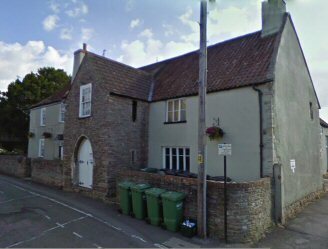 Ann Gwynn was the heir of John Crowther and it seems that that her uncle’s considerable property went to her son Thomas Gwynn who married Margaret Thurston at Thornbury Church 13th May 1819. Ann Gwynn’s sister Betty Smith had died on 5th April 1819. Her husband Benjamin Smith had predeceased her. 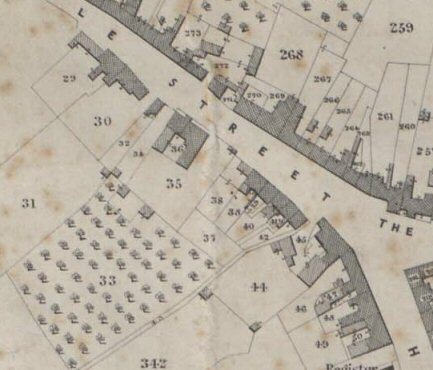 By 1819 the Land Tax Records show that properties in Castle Street previously owned by Benjamin Smith were now said to be owned by his sons Alexander and James Smith. We know that this document transferred the ownership of what is now Clematis Cottage from the Smiths to Thomas Gwynn the son of Richard Gwynn. Number 30 – a House & garden owned by Thomas Gwynne and occupied by William Powell (Clematis Cottage). Number 31 – a Paddock (orchard adjoining) owned by Thomas Gwynne and occupied by William Powell. Number 32 – a House & garden owned by Thomas Gwynne and occupied by William Morgan (number 13 Castle Street). Number 35 – a House & garden owned by Richard Gwynne and occupied by Thomas Gwynne. Number 36 – a House & court owned by Richard Gwynne and occupied by him. These plots (34, 35 and 36) seem to be the house now known as Porch House and the property immediately around it and to the rear. Number 37- a Garden owned by Richard Gwynne and occupied by him. Number 41 – a House and garden owned by Thomas Gwynn and occupied by Edward Pearce (we now know as number 3 Castle Street ). Richard also owned and occupied another field Plot 343 – Loteridge (sic). This field is the one at the end of Latteridge Lane. In the Trade Directories of 1830 and 1839 Richard Gwynn appears as a cheese factor. We know that Richard Gwynn owned considerably more property than that which we have have referred to on this page. For example the records of the Board of Guardians for Thornbury in 1836 show that Richard Gwynn offered to sell them a three acre site along what is now the Gloucester Road for the new workhouse that was to be built. Richard’s price of £150 per acre was initially accepted, but there was a considerable delay while the Governors debated the merits of another site at Coldstones near the site of the present Mundy playing fields. The deal gives us a little insight into the character of Richard Gwynn who obviously drove a hard bargain. Even after the contract had been signed the Guardians seemed very indecisive and were considering other sites, until Richard Gwynn, perhaps driven by frustration as well as thrift, got into trouble for harvesting peas and potatoes off the land which had technically become the property of the Guardians. This placed him in breech of contract and Richard was forced to accept £5 and agree to rescind the contract. The guardians eventually bought a smaller property on the Gloucester Road, near the quarry, which became Thornbury Hospital and which has now been converted into flats and houses. The 1841 Census shows that Richard Gwynn was living in what seems to be a smaller part of Porch House. We are aware that there was a separate property on the same site as Porch House. This was described in an abstract of title of John Crowther Gwynn dated 1879 as a “cottage adjoining” at that time occupied by William Smith. The Tithe Map clearly indicates that Richard Gwynn and Thomas Gwynn occupied separate properties given tithe numbers 36 and 35 respectively and each described as house. An indenture of June 12th 1880 that conveyed Porch House from John Crowther Gwynn to Henry Craven St John described the property indicated by plot number 35 as a house “now taken down” and garden. However the present day Porch House appears to have a very similar size and shape to that of the Tithe Map. We are unable to identify what was taken down, but it is possible that the house was merely converted into part of Porch House itself. In this Census Richard was described as a Cheese Factor. He was 88 and had a house servant Celia Watkins. In the same Census, his son Thomas appeared to have a larger household next to his father which was part of the same house. Thomas and Margaret Gwynn were of “Independent Means.” They had two daughters, Martha Gwynn aged 21 and Elizabeth Gwynn aged 19, and a son, John Gwynn aged 12. They also had two servants; Elizabeth Roach 21 and Eliza Taylor 18. Read more about Richard’s son, Thomas Gwynn and his family. Read about the other owners of Porch House.